Be responsible for your health and attend the 33rd annual 9Health Fair from 7 a.m. to noon on Saturday, April 6 at Summit High School. To save time, register online at http://www.9healthfair.org. The 9Health Fair, sponsored by the Summit County Rotary and St. Anthony Summit Medical Center, will offer basic screenings, only for adults 18 and older, including a blood chemistry screening ($30), PSA screening for men ($25), the blood cell count screening ($15), the take-home colon cancer screening kit ($20) and the Vitamin D screening ($40). In addition, the following free screenings will be available: blood pressure/pulse, height/weight/body mass index, hearing, vision, dental, skin, lung function, cardiac risk screening, sleep apnea screening, joint and spine information and other educational and screening opportunities. > Fast (no food) for 12 hours before having blood drawn. > Drink plenty of water while fasting and bring your own water to the 9Health Fair to help our “Reduce, Reuse, Recycle” effort. > Diabetics should not fast. > Continue taking prescribed medications. > Must be 18 years of age or older to participate. > Please bring cash or checks for payment or register online by noon April 5 with a credit card; we do not take credit cards the day of the fair. > Blood work, with information on how to read your results, mailed directly to your home for you to share with your doctor. Results delivered within four weeks of your 9Health Fair visit. For more than 25 years, the Summit County Rotary has been sponsoring the 9Health Fair in Summit County. More than 120 local volunteers served more than 1,000 people last year. 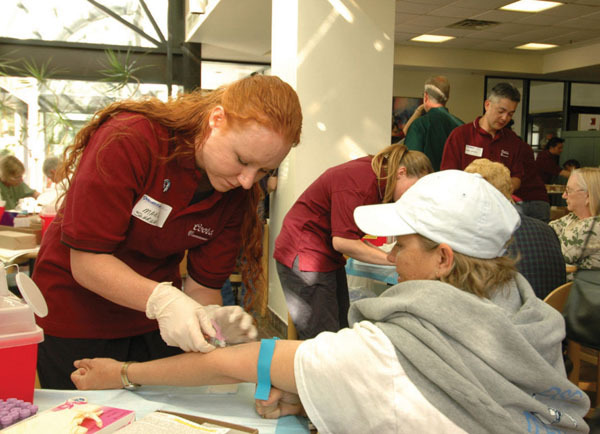 With more than half of those volunteers comprising doctors, nurses and other medically-trained individuals, 9Health Fair needs phlebotomists, registered nurses (RNs), physicians assistants (PAs), medical doctors (MDs), emergency medical technicians (EMTs) and other credentialed medical professionals to help administer a variety of health screenings and draw blood. Retired medical professionals and students enrolled in a medical program can also volunteer, with instructor supervision, and additional phlebotomy training and refresher courses are available through 9Health Fair. Spanish-speaking volunteers to help with on-site interpretation and translation are also needed. For more 9Health Fair information, please visit http://www.9healthfair.org or call 1-800-332-3078.